I am not sure if you are feeling like I do. The older I get the more I am paying attention to my surroundings. A beautiful tree, the bright color of an azalea, the marshland, a wooden bridge, a row house, a blue heron, the way the ocean sounds as you stand at its edge, a historic town; a historic church. For about 10 years I drove to Berlin, Maryland from Bethany or Rehoboth Beach. It was a bit of a hike. I did not mind, though. I always took the scenic route. The road was Rt. 113 going south to Berlin, Maryland. But, before I got there I would have to pass the town of Showell. Did not dare to blink or I would miss it. Then, right after Showell, a small church sat there. It has sat there for 255 years and I cannot believe that the other day was when I finally got to, actually, meet Historic St. Martin’s Church. The location is Rt. 113 & 589 Junction. Four miles north of Berlin, MD. 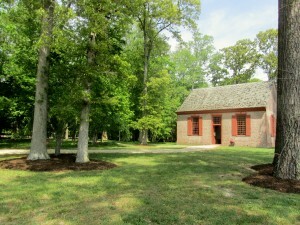 St. Martin’s Church Foundation, Inc., P.O. Box 590, Berlin, MD 21811. Tel. 410-430-2142. Website? 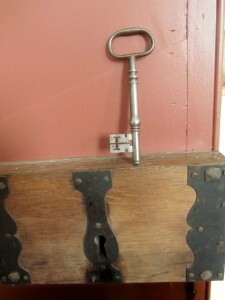 www.historicstmartinschurch.org. You can find them on Facebook. You will have the opportunity to meet St. Martin’s Church, as well, because there are 2 Open Houses scheduled in the near future. Other Open Houses will be added later on in the year. The first Open House will be next week on Wednesday, May 18th from 11 a.m. until 3 p.m. This is in celebration of International Museum Day. Every year since 1977 International Museum Day is organized worldwide. The reason? To raise awareness on how important museums are in the development of society. From America to Oceania, including Africa, Europe and Asia almost 30,000 museums get involved in more than 100 countries. 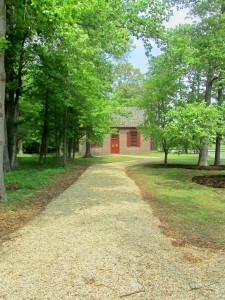 The next Open House will be on Saturday, June 4th, from 10 a.m. until 1 p.m.
Worshippers would have arrived by carriage, horse, boat or by foot to worship at St. Martin’s Church. It was 1756; 20 years prior to the signing of The Declaration of Independence. I cannot imagine what life was like during the times of our country’s founders. Definitely, the simplicity of this Church says it all; it was built in colonial times when life was a challenge; it took brave hearts and determination. 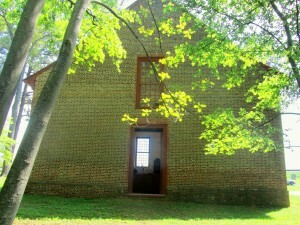 Historic St. Martin’s Church is the oldest of 11 Worcester County Museums. Worcester County is the easternmost county located in Maryland. The county contains the entire length of Maryland’s Atlantic coastline. Its county seat is Snow Hill. St. Martin’s Church once sat next to a tributary of the Saint Martin’s River; Windmill Creek. A lot has changed through the years. The geography has and the river no longer flows by. But guess what? 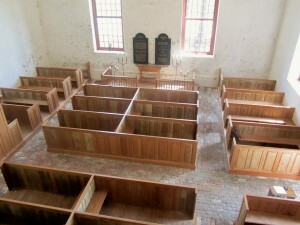 The building that once housed this Anglican Church, where people came and worshipped remains, along with its secrets. 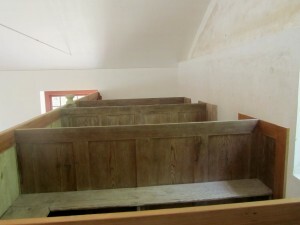 This was an Anglican Church. Anglican vs. Episcopal? When the Revolutionary War occurred in North America, the U.S. declared its independence from England and American Anglicans changed their name to “Episcopalians” to avoid persecution. Episcopal means to have bishops, but Episcopalians are still Anglicans today. And there I was with Sherrie, Sue and Cindi. I wanted to see St. Martin’s so that I could write this post. I had heard that for years a group of community leaders were determined to preserve this gem of architecture. This group is working hard to promote St. Martin’s. 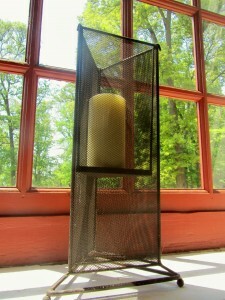 They are trying to help raise awareness of its historic value and its funding needs. The first thing you will notice as you get out of the car and take the surroundings in is that even though it is adjacent to a major highway, it is so quiet and serene. 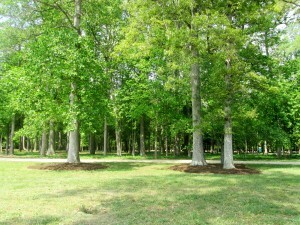 Towering pines surround the property. 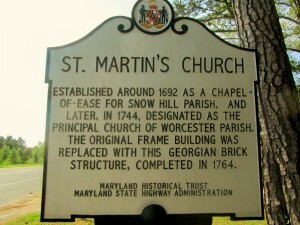 A Historical Marker by the Maryland Historical Trust will tell you that St. Martin’s Church was established around 1692 as a Chapel-of-Ease for Snow Hill Parish, and later, in 1744 designated as the principal church to Worcester Parish. 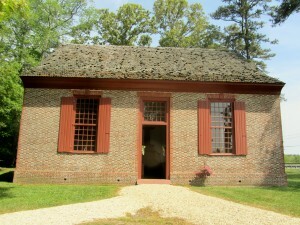 The original frame building was replaced with the Georgian brick structure, completed in 1764. With its Flemish bond brick walls and the glazed checkerboard pattern on the south wall, you can tell it was built in colonial times. 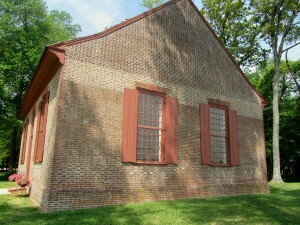 Rubbed brick borders highlight the church’s windows and doors, and the roof features what are called “kicked waves” and cove cornices”. I was so honored to be able to step inside this historic museum. 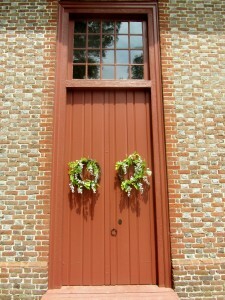 The entrance has double batten doors. One of the unusual features is the flat arches above the entrances. The restoration effort started in 1994. The Foundation Board of Trustees selected award winning Architectural Historian, Paul Baker Touart, to guide the project. 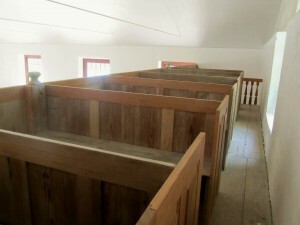 Although most of the building and the grounds restorations are pretty much complete, ongoing preservation continues. 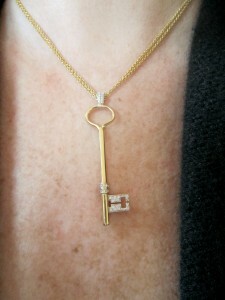 Foundation President, Mrs. Sherrie Beckstead, together with master goldsmith Steve Clarke, has designed a key pendant, which is a replica of the key to the doors of Saint Martin’s. The copyrighted key will be available in sterling silver and 18 karat gold for those who want to purchase this keepsake in support of the historic church. 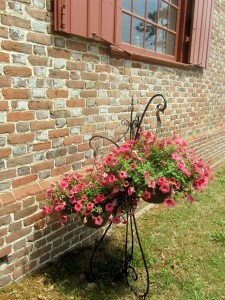 You can call Sherrie Beckstead at 410-430-2142 or e-mail at Historicstmartin@aol.com. And, then as I entered the Church I stepped on the Brick floor. 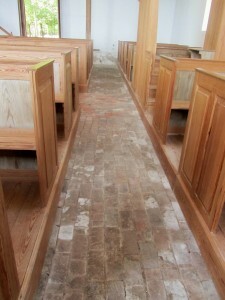 This is the original brick floor. 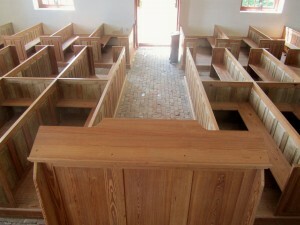 And a look at the simple pine box pews. 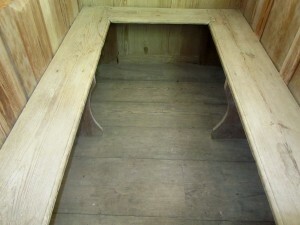 As you take a look at these pictures, please notice that the darker color of the pine, is what was replaced. The rest is all original. 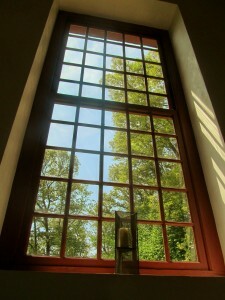 The windows, for obvious reasons had to be replaced. 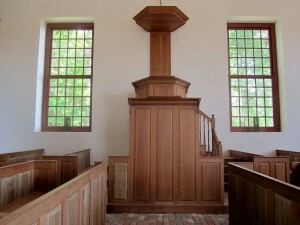 And, that majestic raised Pulpit. 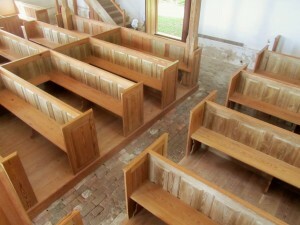 I climbed to the Pulpit where I could get a full view of the pews. 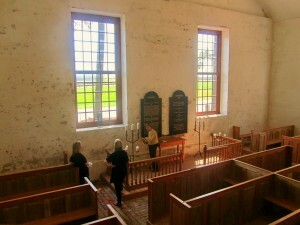 Although St. Martin’s Church is small, it can still accommodate 60 to 100 people. I climbed to the Gallery. From that point of view there is a complete different perspective. Who sat here? 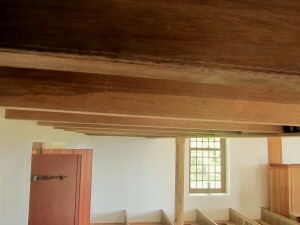 Wide plank pine boards are intact. There is a wall left unpainted and unretouched on purpose. 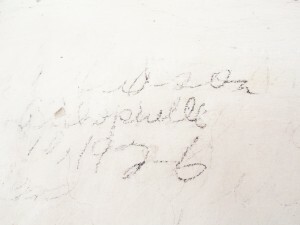 If you look closer you will see all kinds of scribbles and dates. It is a Wall of Remembrance. A mark left by a visitor or worshipper, perhaps. Some dates are that old. Since its restoration, open houses, weddings, musical and art events and lectures have taken place at St. Martin’s. 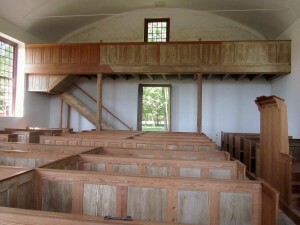 “Historic Weddings” are starting to take place within the Chapel as couples that love history and the Eastern Shore region cannot resist the charm and setting of St. Martin’s. A collaboration involving several historic properties and hotels in the region is working with the Foundation on the creation of “Eastern Shore Historic Weddings”. All you have to do is give them a call or visit the website above mentioned for more information. 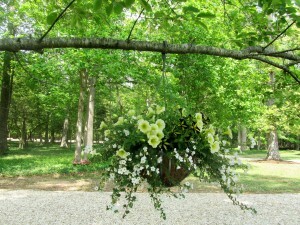 The grounds are beautifully kept. Plenty of parking and enough space for a tent, as well. 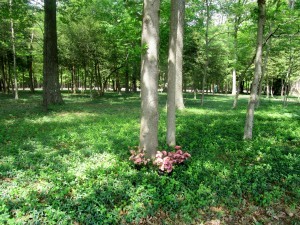 Open every Saturday, beginning June 4th from 10:00 a.m. until 1:00 p.m. Tours are also available. St. Martin’s graciously accepts donations. All donations are tax deductible. Handicapped Access: For special assistance, please call or e-mail prior to your visit. The websites? 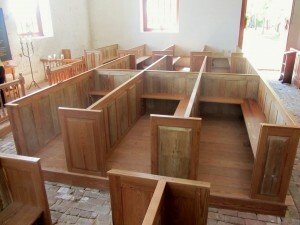 www.historicstmartinschurch.org, or visit Worcester County Museums at www.octhebeach.com/museums. What do you think? It takes my breath away. It has taken a group of people with a lot of help from the community to bring beautiful Historic St. Martin’s Church back to where it should be. Lets appreciate it and enjoy it. 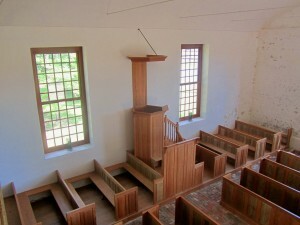 This special and unique church is “Unlocking The Past…While Preserving the Future”. Have a great day! !…Talk to you later…. 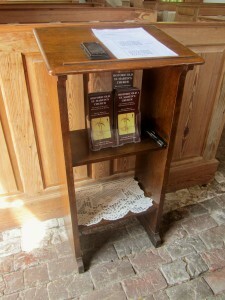 Note: Information for this post came from Historic Old St. Martin’s Church Foundation. This entry was posted on Monday, May 9th, 2011 at 12:41 pm and is filed under Activities, Events, General, Maryland, Uncategorized. You can follow any responses to this entry through the RSS 2.0 feed. Both comments and pings are currently closed. I think weddings are the greatest show of love next to having a child!